How Do You Become a Physical Education Teacher? While some college students want to become a physical education teacher, because it seems like an easy job where you can wear sweatpants to work, it is important to realize that there are serious responsibilities associated with this career beyond the fun and games. 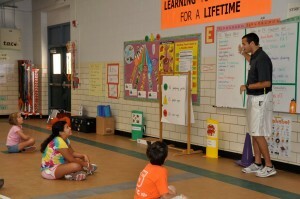 On a daily basis, physical education teachers are responsible for working with students, building healthier lifestyles, being creative with gym equipment in budget cuts, connecting sports with other subjects, teaching other classes on health or nutrition, overseeing the upkeep of the gym, and perhaps even doubling as a coach, according to Human Kenetics. In a step-by-step guide, the following will provide a list of the typical educational requirements for becoming a physical education teacher with the instructional methods needed to improve students’ well-being for life. The first step towards becoming a physical education teacher is to complete an accredited bachelor’s degree focused on a health or fitness-related subject within a teacher education program. In many cases, universities will offer a Bachelor of Science or even Bachelor of Science in Education program with a specific concentration in physical education. Within these four-year degree programs, you will need to take courses in kinesiology, exercise science, physiology, biology, aerobics, recreational sports, nutrition, and health education. In order to ensure that you also have the pedagogical skills needed to teach students in K-12 settings, most schools will require the completion of a student-teaching experience under the supervision of licensed physical education teachers in a school gym. Despite the fact that being licensed is not a requirement for teaching in private schools, it is highly recommended that you become licensed or certified in your state to open career opportunities in the public school system. Requirements for licensure are determined individually by each state’s board, but all will require physical education teachers to have at least a bachelor’s degree from an accredited teacher preparation program and pass all mandatory examinations. Since each state has different licensing qualifications, you should guarantee that your degree program will satisfy the requirements to become licensed right after graduation to easily transition into the workforce. While still enrolling in your college coursework, you should begin working with children and sports to obtain the first-hand experience needed to stand out in the competitive market. Many physical education teachers will begin their career by volunteering at their local community center, leading community-based sports activities, coaching a club sports team, or even refereeing for little league sports. Along with gaining more experience, physical teachers may wish to pursue an advanced degree at the master’s level related to exercise science, health, physical education, or kinesiology to progress into higher-paying positions like athletic director. Overall, as children are becoming significantly less physically active, more sedentary, and overweight, the rising concern has sparked an increasing demand for physical education teachers to teach K-12 students about healthy lifestyle habits. In fact, there is a push for schools to provide 60 minutes of daily physical activity, which will draw a need for more comprehensive physical education programs and more teachers. Once you follow these steps to become a physical education teacher, you will be well-qualified for obtaining positions in public or private elementary, middle, high, and even post-secondary schools nationwide.